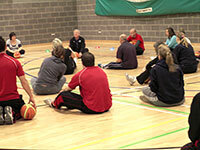 Are you a Sports Coach or Teacher and would like to be trained to coach Mini-Basketball as well? Why not help organise a TOP UP training course especially organised for potential Mini-Basketball coaches in your area. Please contact Martin if you want to know more about organising a course contact Martin Spencer. An after school session usually organised from 3.30pm to 5.30pm to suit the host school and open to all the teachers from a family of primary schools. The session is a practical exploration of the many mini-basketball activities that can be integrated into P.E. lessons or during out of school hours. A copy of the nationally approved teaching manual Mini Basketball – A Guide to Teaching and Coaching by Martin Spencer and published by Val Sabin Publications. Participation certificate for teachers, support staff & playground supervisors.. Visiting schools should also purchase a copy of the teaching manual which is an essential resource for schools introducing mini-basketball. Similar to a TAW, as described above, but a valuable opportunity for PLT's from the Sports Partnership to experience the activities delivered at a TAW. A copy of Mini-Basketball – A Guide to Teaching & Coaching for each participant for use throughout the school. Participants receive an individual course booklet. Full inset day. Our Education officer will work with teachers and their classes taking PE lessons throughout a school day to demonstrate how mini-basketball is an exciting curriculum activity. The school can select the classes from year 1 to year 6 according to the school requirements. A practical workshop aimed at young people who are to assist at a primary school or community mini-basketball club. A course designed for students undertaking a CSLA Course in year 12 & 13. The length and content of the course can be arranged to suit the needs of the participants. An ideal full day session can include the organisation of a Take Six Mini-Basketball Development Festival in the afternoon for a local primary school. In many School Sports Partnerships children are coming together from several schools with their teachers for a sports festival. We can organise a Fun 'n' Games Session for a few schools or a Mini-Basketball Festival for several schools to take place during the school day or after-school. The event will be organised according to the recommended Mini-Basketball England Guidelines and can include a range of challenging mini-basketball activities followed by games. A 10 hour course normally organised over two days for potential coaches and qualified teachers. Usually requires 10 or more candidates who should have previous knowledge of mini-basketball. They will be expected to complete assignments as part of home learning. Please note there may be an extra charge on courses held in areas where an overnight stay is required. Contact Martin Spencer to discuss how he can help with your Mini-Basketball development plan.